UN mission in Iraq says the figure does not include casualties from western Anbar for May, July, August and December. At least 6,878 civilians were killed in Iraq last year as the Iraqi government struggled to maintain security and dislodge fighters from the Islamic State of Iraq and the Levant (ISIL, also known as ISIS) group from areas under its control. The UN Assistance Mission for Iraq, known as UNAMI, said on Tuesday that its numbers "have to be considered as the absolute minimum" as it was not able to verify casualties among civilians in conflict areas. 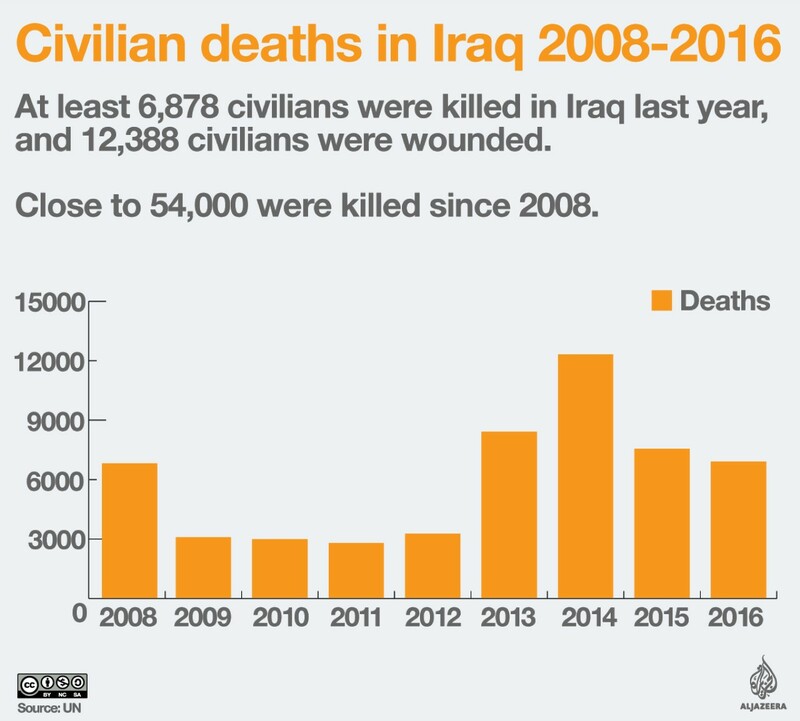 It added that last year figures did not include casualties among civilians in Iraq's western Anbar province for the months of May, July, August and December. According to UNAMI figures, at least 12,388 civilians were wounded in 2016. The monthly UN casualty report for December 2016 showed that a total of 386 civilians were killed and another 1,066 were wounded. The worst affected area was the northern province of Ninevah, where government forces are fighting to retake the ISIL-held city of Mosul, with 208 civilians killed and 511 injured. The capital, Baghdad, came next with 109 civilians killed and 523 injured. In the last week alone, ISIL claimed responsibility for a string of bombings in Baghdad that killed more than 50 people . The deadliest ISIL attack was in July when a massive suicide bombing in a bustling market area in central Baghdad killed almost 300 people, the bloodiest single attack in the capital in 13 years of war. "This is, no doubt, an attempt by [ISIL] to divert attention from their losses in Mosul and, unfortunately, it is the innocent civilians who are paying the price," Jan Kubis, the special representative of the UN secretary-general for Iraq, said in a statement. US-backed Iraqi forces are currently fighting to push ISIL fighters from Mosul, the armed group's last major stronghold in the country, but are facing fierce resistance. Unlike other reports, last month's report did not include casualties among security forces. The UN came under criticism from the Iraqi military last month after reporting that nearly 2,000 members of the Iraqi forces had been killed in November. The Iraqi government has not publicised the casualty figures for government troops and paramilitary forces fighting in Mosul and elsewhere in northern Iraq.